Hello all! I hope you had a great weekend and a lovely Valentines Day whatever you got up to! If you read my January Favourites you'll remember I spoke about this book and said I would do a review of it. Well here it is, today I'll be letting you know my thoughts on I Want To Live by Nina Lugovaskaya. 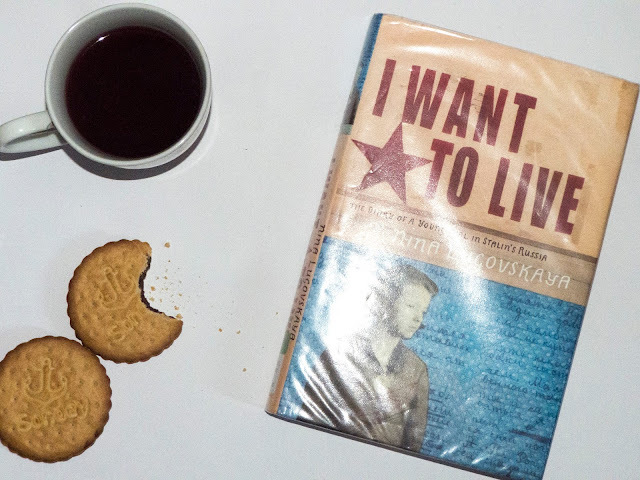 I Want To Live is the diary of Nina, a young girl living under Stalin's rule. As I love history I always find it interesting to read about and Russian history is one of my favourite things to learn about. The diary is made up of three notebooks spanning from 1932 to 1937, the diary shows Nina's day to day life, her confusing as a girl entering her teens, her sometimes strained relations with her family and her distaste for the Soviet Union. In total honesty, as this is a review, the book can be slow to read from time to time as it is the diary of a young girl. Which, to some, would not be very interesting as a lot of it is about her personal life and feelings. However, the book does give insight into what a terrifying time it was to be alive, at one point Nina's home is searched by the military. The fear and hatred in Nina's writing is so powerful that you get a great sense about how many in Russia were feeling towards their government at the time. Nina's diary also shows how much the government was attempting to force their beliefs on people, for instance, Nina writes about how her education was dictated by the state. Nina's writing is beautiful, especially for a 13 year old. She writes so well that you truly feel for her and to some extent relate to her. While most of us are lucky enough not to have to live in constant fear of our government, Nina does face issues that all of us have or will have in our lives. She writes about not feeling talented, her confusion about boys and love and her complicated relationships with her her family. All of these things are very relatable and made me understand Nina and her feelings. I loved how the book added the historical context to some of the things Nina wrote about, at some points Nina writes about things which for her were normal everyday events but that I had no clue what they were or what they meant. The book added information about the things that the reader may not understand, these annotations gave even more information about the Soviet Union and what life was like under Stalin's rule. If you like learning about history and Russian history in particular I would definitely recommended this book. It provides a lot of interesting information and after reading it really made me appreciate everything that I have. Have you ever read I Want To Live? What books would you recommend?